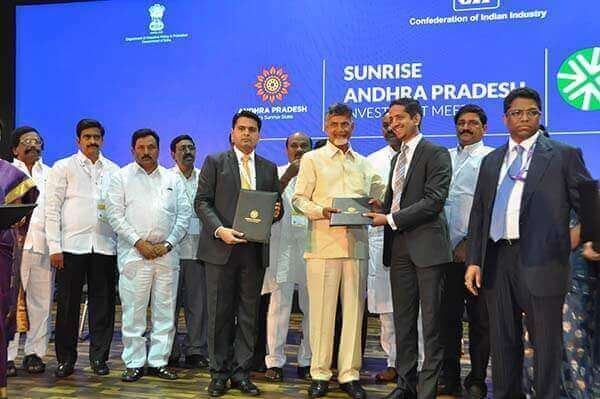 Sri City, January 12, 2016:- At the Confederation of Indian Industry (CII) Partnership Summit being held at Visakhapatnam, on the second day eleven companies signed memoranda of understanding (MOUs) with Sri City with a total commitment of about Rs.1215 crore investment. The MOUs were signed in the August presence of the Honourable Chief Minister of Andhra Pradesh Mr. Nara Chandrababu Naidu. The 11 companies which inked the agreements with Sri City are from different sectors. The highest amount of investment is pledged by Colgate Pamolive at Rs 450 crore followed by Thermax (Rs 200 crore), Isuzu (Rs 230 crore), Vikram Solar (Rs 220 crore), Bachawat Enterprises (Rs 25 crore), Aero Piston (Rs 20 crore), Nucleas (Rs 20 crore), Val-Met (Rs 10 crore), MSR Garments (Rs 10 crore), UNP (Rs 20 crore) and Red Star Plastick (Rs 10 crore). “The need of the hour is creating employment in the region and I am happy that the new Units would offer job opportunities for more than 4000 people,” he added. The Colgate-Palmolive, an American multinational consumer products company, has already a toothbrush production unit in Sri City. The company proposes to expand the unit to produce 600 million toothbrushes per year by enhancing the work force to 1300. Japanese auto major Isuzu, which has already built its factory in Sri City proposes to invest Rs. 230 crores more for project expansion. Vikram Solar, a globally recognised leading solar energy solutions provider, specialised in high efficiency photovoltaic (PV) module manufacturing and comprehensive engineering, procurement and construction (EPC) solutions, proposes to set up Sri City a state-of-the-art FAB-III Manufacturing of 300 MW in the initial phase, creating jobs for around 1500 people. Bachhawat, suppliers of a wide variety of hygienic and fresh popcorns products to domestic market and as well to other countries, proposes to start a production unit of Snacks (Popcorns, Chips etc) and pass-time foods which cater to all sectors of customers. Aero Pistons, reputed manufacturer of precision components viz piston pins, king pins, planet shafts, shaft pinions, sleeves, rod diaphragms, spacers, cover caps, dowel pins, pump shafts etc., for automotive & engineering applications, is keen to open a unit in Sri Cit. The company plans to make piston pins, shafts etc., in this country unit and export them to USA and other European markets. Nucleus, one of the few domestic manufacturers of DTH dish antennae in the organised sector, plans to manufacture three kinds of dish antennae in Sri City. UNP, a manufacturer of single-use hygiene products, proposes to make in Sri City disposable plates and thick banana leaf-like plates, which are 100% biodegradable and compostable. Val-Met Engineering Pvt Ltd (VME) is in the business of ‘Specialty Material Engineering’ like sizing, fabrication and special processing/treatment etc. In Sri City, they plan to produce products by imported raw materials, and export them to USA, UK and other countries, for application in aerospace industry. MSR Garments (Whitcomb & Shaftesbury) was started with a goal to show that in a world of mass-produced clothing, people can wear individual, stylish garments. In Sri City, MSR Garments practices bespoke tailoring catering to a clientele who want their clothing made to individual specifications. They will also be providing necessary skills to the local women and men needed for their industry. Red Star Plastick wants to make PVC edge banding tapes which find application in furniture industry. Red Star is the only Edge band manufacturer in South India. opportunities will be over 36,000.